Halloween Fibre Charm Swap. Here are the little smiley faces. I am so pleased with how they turned out. This is the first time I have tried Felting. I dyed the wool then started to wet felt the wool into balls. It takes about 10 minutes for each ball. Start with a chunk of warm wet wool and some soap in you hand. Then roll softly and slowly adding more presser to the wool. Rolling Rolling. I could speed up the rolling when it was looking round and starting to stick together. 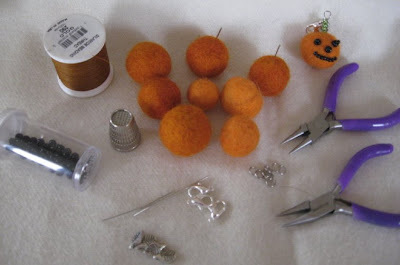 When the orange balls were made and dry, I got out my jewelry findings. I had some trouble getting the jewelry pin into the balls of wool. I sewed the black beads on for a face. I made the stem out of green beads. I added a silver leaf at the top with the lobster claw clasp. I have a few extra and plan to make some earrings for myself. 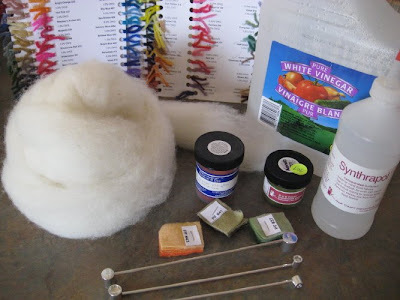 I bought wool last week to dye. Here are the dye supplies set out to get started. Below are the pots simmering on the oven. 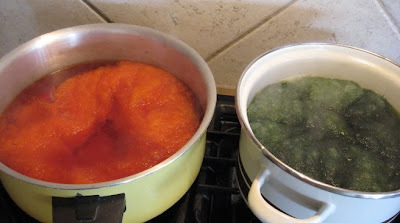 I dyed green thinking I would make the stem from wool but it looked like Florida oranges not pumpkins. I had to dye twice as I did not dye enough the first time. I was surprised how much wool is in a little felt ball. To do my 25 balls I should have dyed two oz of dry wool.